CardPresso is a professional and affordable card software solution: Conveniently create layouts, encode and print (chip-) cards, RFID-cards and magnetic stripe cards. YouCard is an official CardPresso partner, therefore we provide our costumers with the best consulting, support und service regarding the software. There are 5 different versions available, each covering diverse, personal needs. If you are interested in the range of functions to each version, please see the attached data sheet or get in contact with our card-software experts! 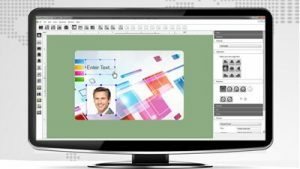 The software offers templates for an easy layout creation of your plastic cards with texts, graphics, logos, shapes, color gradients, QR-codes, barcodes and so on. A personalization of your ID cards is made possible with an automatic database connection of TXT, XLS, CSV or ODBC files. Also photos, signatures and camera/scanner images can be implemented and edited directly with the integrated photo editor (depending on the version, even automatically). Encoding of magnetic stripe-, chip-, smart- and RFID-cards is also possible. With CardPresso‘s full version you can access all installed printers from 16 computers in your network with a network licence. CardPresso is the standard software delivered with Evolis card printers, one of the most successfull card printer suppliers worldwide. Which CardPresso version do I need? To find out which version suits your personal needs in the best way, you can take a closer look into each version’s summary or into the detailled, official datasheet of CardPresso. As an expert in our field we also offer you free consulting and are motivated to find the perfect solution for your individual requirements. The card software is available in the following versions: XXS, XS, XM, XL and XXL. Each version can be flexibly extended by upgrade in a short amount of time, so that you can start with the XXS version and upgrade to XS if necessary. Just give us a quick call! If you want to find out more about CardPresso you can visit their YouTube channel and see helpful tutorials and videos. For special requirements like integrated visitor- or employee-management solutions, we suggest our software solutions YouCard YouChip and YouEvent. Our in-house software solutions are highly adaptable and can be programmed from our IT-experts, so that they fit your personal needs. CardPresso XXS is the perfect soultion for simply printing plastic cards. Don’t waste time with reading complex manuals and get started right away with the many basic features of plastic card printing. Single- and dualsided printing of plastic cards is possible. You can even import pictures from cameras or scanners, print QR- and barcodes, print via network and also encode magnetic stripe cards. Needless to say, the XXS version of cardPresso is a solution for small card printing projects and the encoding of magnetic stripe cards. With cardPresso XS you own all functions of the XXS version and additionally the ability to connect and manage databases. You can manage and import database formats like XLS, CSV and TXT. If you are interested in connecting other formats, please get in touch with us. CardPresso XS is your solution for small card printing projects with card personalization based on database. CardPresso XM owns all functions of XS and many more. Full-automatic serial printing and the encoding of contact chip cards is made possible in this version. Through an internal MS Access database connection and an integrated photo storage, bigger card projects can be realized in a full-automatic way. Also printing of 2D barcodes like QR-codes and automatic face editing via FaceCrop-tool is possible. This way ID cards can be focused and cropped automatically. XM is suitable for comprehensive card printing and encoding projects. The cardPresso XL Version owns all functions of XM plus more extensive possibilities regarding the creation, encoding and printing of your plastic cards. This version allows you to encode contact chip cards like I²C-Bus, SLE5542 and RFID chip cards like MIFARE and RFID. Furthermore XL owns functions especially created for the management of bigger and more complex card printing projects. An universal ODBC database connection for example, allows management of various card layouts. All in all XL Version is your solution for complex projects with special requirements for RFID encoding. CardPresso XXL is the perfect solution for very comprehensive and complex card printing/encoding projetcs. XXL owns all functions of XL and is furthermore capable of encoding MIFARE DESFire and MIFARE® DESFire NFC transponders. You also have the possibility of connecting up to 16 computers with CardPresso via network license or a web-print-server. If you are looking for a solution that allows the handling of printing and encoding of chip/RFID cards by various employees, CardPresso XXL is your solution.